Duplication is more than simply making a copy – it is the art of making the best, most precise copy possible. 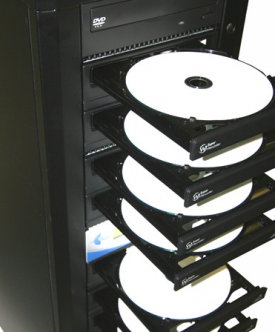 From DVDs and CDs, to files using the leading professional video formats, we have the equipment and exacting standards to ensure that our duplication services produce perfect copies every time. We also can convert your digital video from its current format to just about anything you can imagine. We accommodate small jobs with quick turnaround times, large jobs that require specialized printing and labeling – and everything in between. Whatever your duplication needs, we can help. We can even make sure your videos make it to your recipient list on time by distributing it directly from our offices.